Kiwanuka while visiting Uganda in 2013. Mathias Kagimu Kiwanuka (born March 8, 1983) is an American football defensive end who is a free agent. He was originally drafted 32nd overall in the 2006 NFL draft. He played college football at Boston College. He earned two Super Bowl rings with the Giants in Super Bowl XLII and Super Bowl XLVI, beating the New England Patriots twice. Kiwanuka was born in Indianapolis, Indiana and attended St. Simon the Apostle elementary/middle school and Cathedral High School, where he led the team to 3 straight IHSAA state championships and a national #5 ranking. At Cathedral he played tight end and linebacker and played with future NFL player OT Jeremy Trueblood. Kiwanuka played in 49 games with 38 starts for Boston College and recorded 245 tackles (155 solo) and set school records with 37.5 sacks and 64.5 stops for losses. Also, he recovered 2 fumbles, including 1 for a 49-yard score, and had 3 forced fumbles. Also deflected 13 passes and intercepted 3 others, returning one 32 yards for a touchdown. 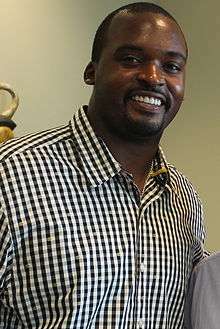 Kiwanuka, who was widely regarded as one of the best pass rushing defensive ends in college, led the Big East Conference in sacks during the 2003 and 2004 seasons with 11.5 each season. He was an All-American in 2005. He finished his senior season with 51 tackles (34 solo) with 9.5 sacks and 16.5 tackles for losses. In 2005, he was involved in an incident with Virginia offensive tackle Brad Butler, who hit Kiwanuka after the whistle. Kiwanuka was forced to miss Boston College's next game because of injury, and Butler received a one-game suspension. Kiwanuka was later ejected from the game for seeking revenge. He was a First-team All-American in 2004 and was named Big East Defensive Player of the Year in 2004, as he produced 11.5 sacks, 24.5 stops for losses and 67 tackles (36 solo). Kiwanuka also picked off 2 passes, returning one 32 yards for a touchdown. In 2003, he earned All-Big East honors while leading the conference with 11.5 sacks. As a redshirt freshman in 2002, he appeared in every game, starting the first 2 at left defensive end. He made 44 tackles (27 solo) with 5 sacks and 7.5 stops for losses. Kiwanuka was drafted with the 32nd overall pick of the 2006 NFL Draft by the New York Giants. On July 25, 2006, Kiwanuka signed a five-year $10 million contract with $5 million guaranteed. In his first season he played defensive end and played in all 16 regular season games with 9 starts and finished the season with 55 tackles (41 solo), 4 sacks, 2 interceptions and 2 forced fumbles. In 2007, he won the starting strongside linebacker position after spending the entire offseason learning the new position following a rookie year spent at defensive end. He started all 10 games in which he played and finished the season with 47 tackles (24 solo), 4.5 sacks, 4 passes defensed, 1 forced fumble. Kiwanuka’s season ended at Detroit on November 18, 2007, when he suffered a fractured left fibula. He had surgery to stabilize his leg and ankle the following morning and was placed on Injured Reserve, ending his 2007 season. In 2008, Kiwanuka entered training camp as the starting strongside linebacker, but returned to defensive end when Osi Umenyiora suffered a season-ending knee injury during the preseason. He started all 16 games and the NFC Divisional Playoff game at right defensive end and finished the season with 59 tackles (28 solo), 8.0 sacks, 13 tackles for loss, 2 passes defensed, 2 forced fumbles and 2 fumble recoveries. Through the 2008 season, Kiwanuka has played in 42 regular season games with 35 starts – 25 starts at defensive end and 10 starts at strongside linebacker. He has also started 2 postseason game at defensive end. In 3 seasons, he has 161 tackles (93 solo), 16.5 sacks, 2 interceptions and 5 forced fumbles. Kiwanuka was placed on IR on October 28, 2010, due to a herniated disc. On April 27, 2012, the Giants extended Kiwanuka's contract, giving him $16.5 million over 3 years with $10.5 million guaranteed. While playing with the Giants, Kiwanuka was a resident of Hoboken, New Jersey. On February 21, 2013, The New York Giants and Kiwanuka have agreed on a restructured contract. The restructured deal, converts $1.5 million of Kiwi's 2013 guaranteed base salary into a signing bonus. The new deal saved the Giants approximately $1 million towards the 2013 salary cap, but will slightly increase his cap number in both 2014 and 2015. On February 24, 2015, Kiwanuka was released. He is the grandson of Benedicto Kiwanuka, the first Prime Minister of Uganda. ↑ "Mathias Kiwanuka". Niner Cap Hell.com. March 25, 2006. Retrieved April 16, 2009. ↑ (July 26, 2006) Sporting News. Retrieved May 10, 2009. ↑ Lourie, Steven. "New York Giants extend OLB Mathias Kiwanuka". Retrieved 2012-04-27. ↑ Mullins, Michael D. celebration "Was it the shoes? Local fan says he has secret of Giants' success, as city plans celebration", Hudson Reporter, February 19, 2008. Accessed February 6, 2013. "City officials said that besides quarterback Eli Manning, who lives in the Hudson Tea Building on 15th Street, linebackers Kawika Mitchell and Mathias Kiwanuka are Hoboken residents." ↑ "New York Giants Reconstruct Contract of Mathias Kiwanuka". ↑ Patra, Kevin (February 24, 2015). "New York Giants release DE Mathias Kiwanuka". NFL.com. Retrieved February 24, 2015.